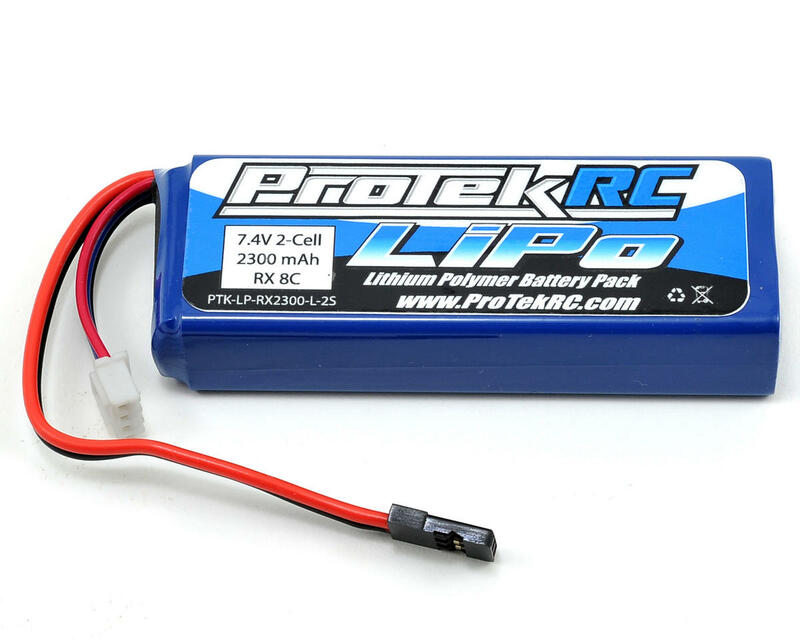 This is a Li-Poly 2300mAh receiver battery pack from ProTek R/C, made with super thick 20awg silicone wire! This super light weight Li-Poly battery is designed to power the electronics of 1/10th & 1/8th scale nitro powered race cars. There are many advantages to using a Li-Poly receiver battery, but the biggest advantage is that the battery voltage to your receiver and servos will remain constant throughout the race with the use of a voltage regulator (required). A constant voltage level to your servos will ensure consistent performance at the start and end of your race compared to typical NiMH receiver battery packs. Additionally, the overall weight of your race car will be significantly reduced over the use of typical NiMh receiver packs. These packs are built with a lexan plastic shell around the outside of the battery, and then covered in blue heat shrink. The lexan shell is designed to protect the battery cells while in the vehicle, for longer life. Note that due to the lexan shell, sometimes the battery may feel soft to the touch on the outside of the battery; this is normal as there is a small air gap between the lexan shell and the battery cells inside. Perfect battery for the Airtronics M11X/M12 radio! This battery is also the perfect transmitter battery for the Airtronics M11X and M12 transmitters, which require a 2S Li-Poly battery for operation. Don’t be thrown off by the capacity rating of Li-Poly battery packs, as you will get awesome runtime out this pack! Unlike NiMH battery packs, Li-Poly battery packs do not lose voltage as quickly over time and can handle higher current draw than typical NiMH battery packs. Given that Li-Poly battery packs provide a higher nominal voltage (7.4V nominal), the actual capacity of the battery pack when compared to a typical NiMH battery pack (6.0V nominal) is about 30% more than the rated value (so this pack would be about the same as a 3000mAh NiMH pack in total capacity). Also with the use of a voltage regulator, Li-Poly battery packs will produce the same voltage to your receiver and servos at the end of the pack as it does at the start. This means the useable capacity of the battery pack is significantly more than typical NiMH battery packs, because most NiMH battery packs will produce significantly less than the 6.0V nominal voltage once they get below half capacity (ie: your servos will be a lot more sluggish if your typical NiMH battery pack is below half capacity). NOTE: When using high energy Li-Polymer Batteries, please do not over-discharge or over-charge batteries as this will result in over heated batteries. Discharging capacity can't exceed 80% of the max capacity of the pack after full charging to ensure a good cycle performance. It is recommended to fully charge a brand new battery before using and only discharge the battery 50% for first 5 cycles. Always monitor race time and/or set a low voltage warning on ESC (End voltage cannot be lower than 3.2v per cell). Do not use the battery that has too low a voltage. Do not expose batteries to sunshine or store/charge batteries at the temperature above 35°C or in a closed car. The high temperature environment could cause damage to the pack or make it burst. If the battery becomes hot while fast charging, high current discharging or racing, do not charge the battery until it has cooled completely. Wait about 20 mins, then inspect prior to recharging. I have a mbx6t and I love the way the battery fits in the car but the durability of this battery is lousey. I have 2 of these and neither is worth having.After 3 or 4 charges the batterys (both of them swelled up) neither pack would balance,as far as I am concerned that was 80.00 wasted. 7 of 8 customers found this review helpful. Used this pack for 3 days, and of course on the 3rd day which was the mains something internal breaks on the battery 4 minutes into the A-main, so thanks alot protek. Fits the MBX6 perfectly, well super snug, but MAJOR issue is that you have to watch these packs as they swell. Only charge at 1.0amp and not the standard 2.3amps. These are touchy about being overcharged, discharged, and heat. I think ProTek 'Amain' needs to redesign these or have the company who makes these put better LIPO cells in these RX packs. 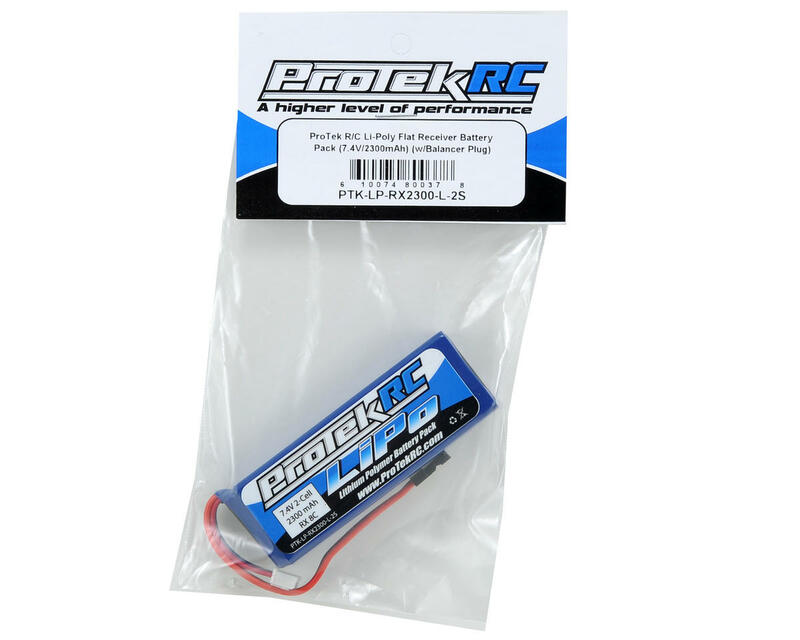 I like all other ProTek items but these are way down on the list of the normal quality you would expect from ProTek, so I would suggest to look elsewhere for the LIPO RX flat packs. YOU MUST NOT EXCEED 0.5 AMPS!!!! if you do, you need to buy extra batteries and a fire extinguisher. It is a LIPO and requires a lipo charger. There are plenty to pick from. I like the hyperion line of chargers. It's gonna be a pain to pull this back out. Installed it a few weeks ago and tried charging it today. Only one cell registers, the other is dead. Pulled out another 2s rx pack and it was fine. Should of paid attention to the 1 star reviews, they apparently are warranted. Update:Jun at Amain took care of the issue, quickly and easily. HE even went out to personally check the replacement being sent. Great pack with good capacity. It can be used in my buggy or my transmitter. Works great in long main events. I have been using this for years in my buggy. très bonne lipo deux saisons de course sans problèeme. Been running mines 2 years and they work just fine!!! I've been using these for a couple of years now, They have never let me down. I've never had one puff up and I get great run-time out of them. I really like this batt....I actually run one in my MX-3X transmitter & one in my MBX7, I've never had a single problem with either one all season, the Tx battery lasts several trips to the track and the Rx batt I run a charge through after each main race, no problems. This receiver and radio battery fit perfectly in my Mugen MBX7 and Airtronics M11x. Lasts for DAYS on 1 charge! Excelente Bateria, ya tengo 3 meses usandola y es perfecta, liviana y resistente para mi MBX6R, dura todo el dia en la pista y no tengo que preocuparme por cargarla, mas que suficiente para un fin de semana de competencias. Great battery pack! Fits perfectly in the Durango truck or buggy. After 3 yrs on my first pak it FINALLY died yesterday. Balanced every charge and always held a perfect balance til the very end!! And I did alot of racing with this pak. I am about to place another order for 1 or 2 more new 1s. The only issue I have is that the paks need a little better skin/cover on them. I am going to see if I can find some heat shrink to put around the outside to give it a little more protection. Fits perfectly into my 6t and my Intech BR-5. Pack works as it's supposed to. Lasts all day in my mbx6 w/ two high voltage savox servos (sc-1267). Using a Airtronics 92744 reciever, no regulator, no nothing. Great battery, would buy again.